1. Heat the pan add oil temper mustard, urad dal, channa dal one by one..
2. After it sputters add ginger, curry leaves and chili and saute for a second. 3. Add onion ,and saute till slight brown then add tomato and saute until it mushy. 4. After add grated carrot and saute for a minute. 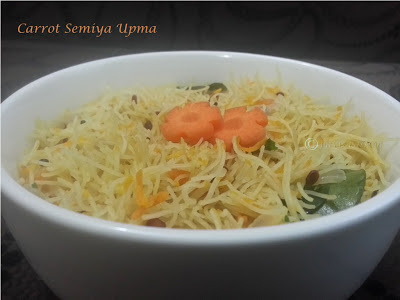 5.If you are using Anil vermicelli Add 400ml water and bring to boil, put salt in it after it boiled add vermicelli and cook in low flame until it cooked. If you are using pasta type vermicelli(bigger) , boil water(double the quantity of vermicelli) in another vessel put salt and vermicelli in it. When it softly cooked remove it and strain it using strainer. And wash it in cold water and strain it again. Add this cooked vermicelli to the carrot masala mixture and mix thoroughly. 6. Serve hot with curd or coconut chutney.